Helen A. 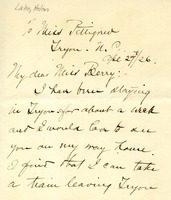 Lake who has been staying in Tryon, N. C. states that she would like to see Miss Berry on her way home. She asks if this is an opportune time for a visit and the name of a hotel in Rome. For her, this would gratify a long, cherished desire to see The Berry Schools. This letter is sent in care of Miss Pettigrew.